Realme is all set to introduce its first selfie-centric smartphone dubbed Realme U1 in the Indian market. This phone was recently spotted in CEO Madhav Sheth’s hand, giving us a small glimpse of it. Adding to the device’s ever-growing list of leaks, we now have its AnTuTu benchmark scores. 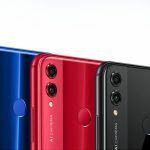 According to those scores, the device beats Xiaomi Redmi Note 6 Pro and Honor 8X. The leaked image also confirms that the device will feature a teardrop notch on the front. On top of this, we also got our hands on the device’s leaked retail box image. 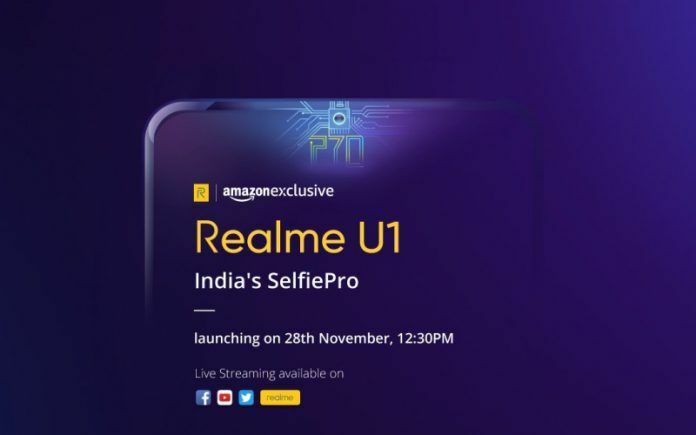 Realme will launch the smartphone on November 28 as an Amazon exclusive. 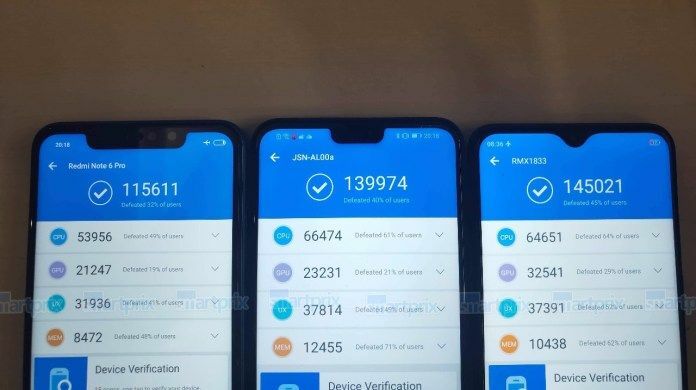 The recently leaked AnTuTu score image shows three devices with their benchmark scores. 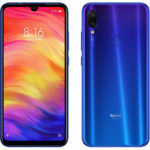 The smartphones which participated in the leaked comparison are Xiaomi Redmi Note 6 Pro and Honor 8X with the model numbers JSN-AL00a and Realme RMX1833 respectively. Here, Realme RMX1833 is the upcoming Realme U1 which previously made an appearance on a GeekBench listing. We’re already aware of the fact that Realme U1 will sport the latest MediaTek Helio P70 chipset inside. One thing which we’re unaware of is the performance of the chipset. These leaked scores give us an insight into the capabilities of the upcoming smartphone as well as the chipset. 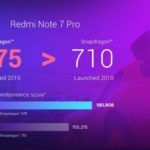 The Redmi Note 6 Pro, which is powered by the Qualcomm Snapdragon 636, managed to score 115611 in the test. 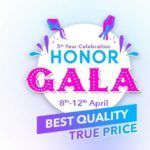 Honor 8X and Realme U1 scored 139974 and 14502 respectively. If you’re unaware, the Honor 8X runs on the Huawei’s own Kirin 710 chipset. 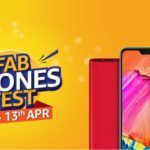 Realme U1 clearly beats the Redmi Note 6 Pro with a wide margin. The competition was a lot closer for the Kirin 710-powered Honor 8X. It is worth noticing that we can’t rely on the benchmark scores entirely. There are other factors like software optimizations which actually determine the performance as a whole. One thing which these scores do point out is that the MediaTek Helio P70 is quite a promising chipset for budget devices. 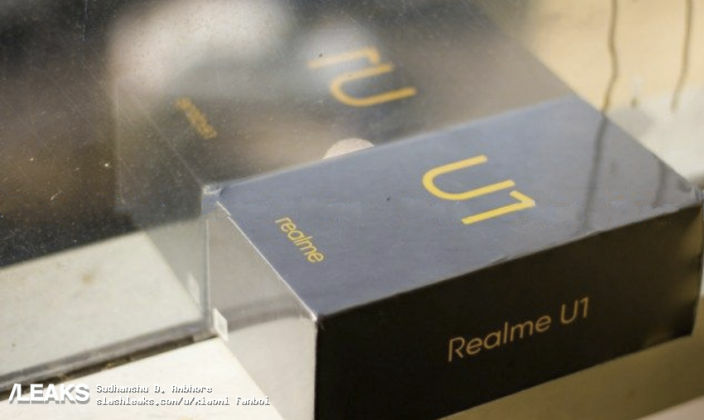 In another leak, we now have the live images of Realme U1’s retail box. A Slashleak user who goes by the name SUDHANSHU added some pictures of the device’s retail packaging. According to these images, the retail box seems to be entirely black with the brandings printed in yellow colored font. Unfortunately, the images do not reveal any specifications of the device. Since the launch of this phone is right around the corner, we’re expecting more leaks and teasers to come forward. To recall, Realme U1 is expected to come with a Full HD+ display having an aspect ratio of 19.5:9. It will also feature a teardrop notch on the front giving it a screen-to-body-ratio close to 90%, as seen in the Realme 2 Pro. It is powered by a MediaTek’s Helio P70 octa-core chipset paired with a Mali-G72 MP3 GPU. There is expected to be a dual camera setup at the back and a single 25MP front-facing selfie camera. The device might also come with Oppo’s VOOC fast charging support. Previous reports suggest the device will run on the massive 4,230mAh battery. As far as the pricing is concerned, we expect Realme U1 to cost somewhere between the INR 10,000 and INR 15,000. 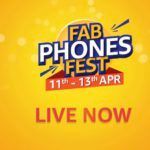 If this is indeed the case, the device will compete with several brands like Xiaomi, Honor, Nokia and Motorola who also offer compelling budget-friendly handsets.